This article was written By Adam Hartzell on 20 Nov 2014, and is filed under Reviews. It seems like New Korean Cinema came full circle this summer. Just as Shiri (1999) sank James Cameron’s Titanic (1997), so has The Admiral: Roaring Currents sent Cameron’s Avatar (2009) down a whirlpool, cresting over as the most successful film ever in South Korea. As for how good Kim Han-min’s film actually is, I like how my colleague Darcy Paquet summarized it over at Koreanfilm.org as, “It’s the kind of film [which] engages you while it is onscreen, but leaves you with little desire to revisit it afterwards.” I would have to agree. Obviously, with all the money the film is making in South Korea and abroad, the producers and everyone else involved with The Admiral can choose to ignore any criticism I or anyone else has about the film. But if you can indulge me for the rest of this piece, I wanted to take a moment to offer up a missed opportunity in The Admiral that could have made it a film I might want to watch again. Before I go further, let me say that I am not one to expect films depicting historical moments/figures to be completely accurate. The most obnoxious or politically questionable re-writing of history must be called-out, but a narrative flourish here or there may be required to push the film along or to have the film resonate with the time in which it is released rather than the time period which it depicts. And The Admiral missed a major opportunity for narrative flourish in the only love interest in the film, that between Jung (Jin Gu) and his wife (Lee Jung-hyun) – I haven’t been able to locate a name listed for the wife if the character was indeed given a name. Jung’s wife is unable to speak. It is unclear if she is also meant to be deaf. But most folks I’ve spoken with read the character as deaf. From here on out, I will speak of her as deaf because that is how the character seems to be received and the film seems to imply that she’s deaf and can read lips. She also ‘signs’ a tiny bit when we first meet her. That is, we see her repeat the same forced, awkward signing many hearing directors request of hearing actors playing deaf characters. I personally feel that deaf characters and characters with disabilities should be played by actors who share those embodiments whenever possible. In the case of deaf characters, at the least a hearing CoDA, Child of Deaf Adults, could be cast, such as the very capable Lim Eun-kyeung who I was happy to recently read is back in the acting game after a decade long hiatus. I won’t go into defending that preference here outside of saying that when such embodiments between character and actor are synchronized, a better awareness of the possibilities for realizing that character on screen can arise. The deep love Jung and his wife have for each other is demonstrated in a moment during the film that I won’t ruin here. That scene could have been developed at an even deeper level with a better understanding of Deaf History and Culture. During a pertinent scene in The Admiral, we are led to believe that Jung’s wife, who is on shore, is reading Jung’s lips, who is on a ship, from a distance. This long-distance lip-reading trope is one often demanded by film and TV productions because it enables them to put hearing actors in the roles. Otherwise these productions would have to engage in more extensive casting calls of deaf actors and provide the necessary accommodations. The long-distance lip-reading plot point is a means to maintain the status quo rather than hiring deaf actors and educating ones hearing cast about deaf culture. We can just give the deaf character superhuman powers to lip-read from far away so we can default to a hearing actor. Lip-reading is a subtle skill, made way more difficult at the distance depicted here. Such instances of long-distance lip-reading aren’t as likely to be as successful as our film and TV productions portray them. What would have been more believable is if the characters had communicated through a sign language. It would have made more sense as a means to communicate because Jung’s wife is deaf and sign languages are more reliable from such distances. Add the roar of the ocean to the distance and you can see why visual languages are better equipped to handle such conditions than spoken languages. Even if the villagers near Blood Island didn’t have the same concentration of genetic deafness as Martha’s Vineyard to warrant a BISL, many families with deaf members existing outside a larger deaf community develop ‘home signs’. Jung and his wife could have communicated via their home signs from ship to shore just as the ships communicated via flag sempahore. Such would be a far more realistic form of communication than the forced trope of long-distance lip-reading. As far as I know, the characters of Jung and his wife and her being deaf are not meant to be historically accurate. There is a deaf character in War of the Arrows (2011) as well, so it just might be something Han likes to work into his films. Like I wrote above, I am not a purist. I don’t need each character to be actual characters based in history. I am fine with making up such characters if they serve a clear, helpful dramatic purpose. And in this case, the couple allows for further melodramatic impact. As much as I tried to paddle against the current of melodramatic moments this couple afforded, I could not resist the force that drove me toward tearing up from their predicament. And this melodramatic purpose could have been improved were a deaf actress cast to use Korean Sign Language. The presence of KSL shared between this couple would enhance their devotion because such would demonstrate the major efforts Jung made to understand his wife’s world, to understand his wife’s natural language. Plus, KSL, a language that allows for visible manifestation of emotion through physical expression, is perfect for cinema. Used well here, it would further draw us all into the melodramatic miasma that South Korean directors conjure so well. This demonstrates that these made-up characters could have been better developed if those involved in creating them were aware of Deaf History. The narrative flourish I suggest above is based in a historical fact, albeit one from outside the Korean peninsula, but such a flourish would be legitimate since sign languages emerge among isolated families with deaf members (home signs) or where deaf folk congregate (such as Nicaraguan Sign Language emerging at Deaf schools within a generation). Plus such historical consideration adds further depth to an otherwise plot-device character, something for which deaf characters and characters with disabilities are often misused. I approach issues facing the deaf from the Deaf Culture Studies frame of a linguistic minority. It is the suppression of their regional sign languages and the fact that the overwhelming majority of hearing folk do not learn their region’s sign language that ‘disables’ deaf folk. That said, issues impacting deaf folk and people with disabilities often intersect. A character’s deafness or disability shouldn’t be a plot device or used solely as a metaphor. Such embodiments are real lived experiences that can demonstrate ways to envision a world from the unique frames each of us were born into. We can see other possibilities of what constitutes the human experience through our bodies, bodies that differ along various spectrums of physical aptitude. In The Admiral, the vulnerability of Jung’s wife is just a plot-device. Adding this aspect of Deaf History and having a deaf actress would anchor the character as one who is fully-fleshed out, more than just a prop or metaphor. Even in a CGI blockbuster, a little flourish from Deaf History could have added another layer of interest to this film. By casting a deaf actress in this role, clichéd depictions of deaf characters, such as the ridiculous conceit of long-distance lip-reading, might have been avoided. The Admiral isn’t a brilliant film. 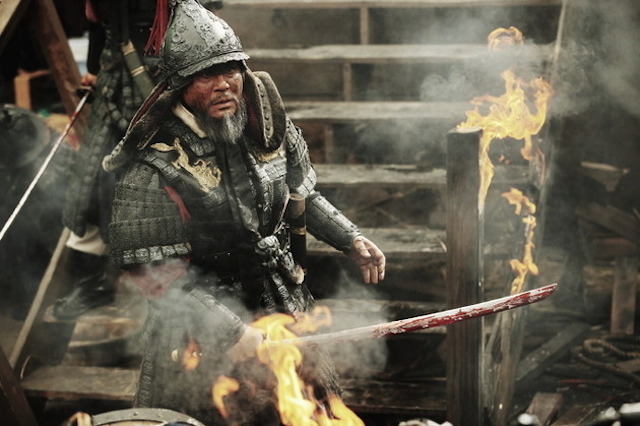 It has it’s highlights – the special effects, the costumes, the battle scenes, and the great Choi Min-shik. But if they had worked in a better understanding of Deaf History and Culture, it would have added another highlight. It would have added greater depth to this film, creating a cinematic undertow that would have pulled this viewer back into its box office breaking wake for repeated viewings.